Shaun Masavage wanted a device to help people make better decisions after drinking. 2014 saw a successful Kickstarter campaign for his DrinkMate product for Android and a new funding round is currently running for the iPhone version. DrinkMate is billed as the smallest breathalyzer in the world, and fits in an iPhone's lightning port to take a blood alcohol content reading. The user blows into the device instead of putting their mouth around a tube, allowing the DrinkMate to be shared between friends. Masavage says that using DrinkMate is simple even when in a compromised state. Social media and social drinking are both taken into account when using DrinkMate. Several users can test their blood and compare results, and then share the results to Facebook or Twitter. The app displays your score along with the United States Limit of 0.080% BAC. A rolling timer also tells you how long it will be until you're sober. The basic social idea is that a group of people are better off if they're all aware of their alcohol level and can help each other to make safe choices. DrinkMate is powered by the iPhone and has no battery on its own. The sensor and BAC computations are patent pending but calculated differently than a breathalyzer, calibrates based on several months of Android usage, and takes sensor aging into account. The measurements are accurate to + / - 0.01% BAC at a BAC of 0.02%. 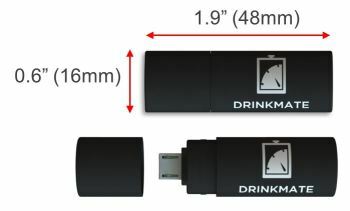 iPhone's lightning connector holds the device in place without additional bracing, and if the phone is dropped the DrinkMate is designed to break away to eliminate phone damage. The Kickstarter campaign has raised $27,000 of its $35,000 goal in just the first day and looks more than able to complete its funding. DrinkMate's concept has been proven and the only possible issues involve Apple's rules for manufacturing. Hopefully this product meets its October shipping goals and makes the world a little safer for the drinkers.